Bill Wilson, founder of Metro Ministries International, challenges women’s and girls’ groups in the IPHC to participate in their annual Christmas stocking project. Metro Ministries International (an affiliate of the IPHC) touches an incredible number of children on a weekly basis through their Sunday school outreach. Approximately 25,000 children are brought in by bus every Saturday for sessions geared toward ages 3-12. For many of these boys and girls, this stocking will be the only Christmas gift they receive. (Click on the Metro Ministries name on the first line to learn more about their ministry. )Stockings are made out of felt – red for girls and green for boys. They are sewn together and filled with items such as butterfly clips, jewelry, jump ropes, Matchbox cars, small army figures, socks, watches, etc. You can include $10 per stocking rather than fill it to help with the cost to ship. Metro can then use the funds to fill the stocking in New York. A stocking pattern and list of ideas for filling it are available by clicking on the link below. It is never too early to start shopping for Christmas since these stockings should be completed and on their way by mid-November. They must arrive to Metro Ministries by November 24th. Hint: Buy your fabric this year when it might be on sale and then choose different months next year to trace, cut, and sew the stockings. Then all you have to do in November is bring in the goodies and fill the stockings. 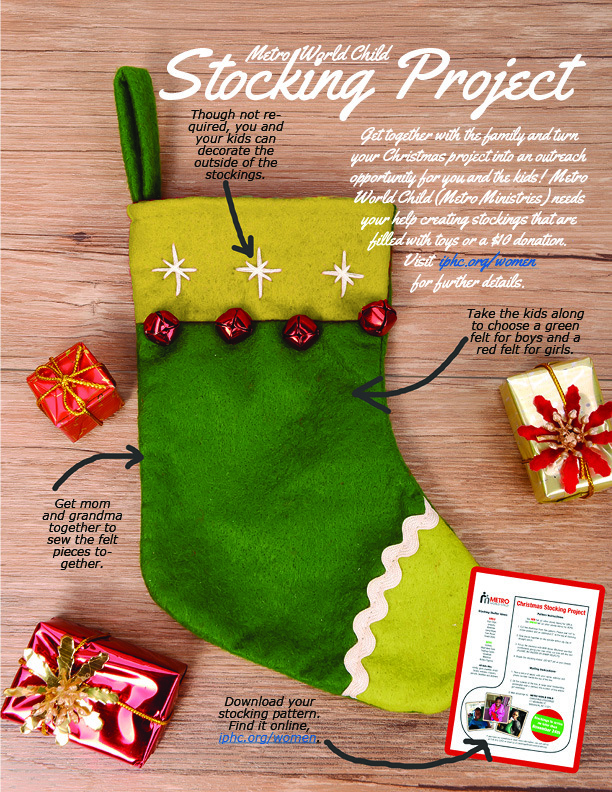 Click here to download the pdf for the Christmas Stocking pattern and info.